Ubisoft is getting ready to launch the sequel to its open-world CarPG racing game The Crew at the end of next month. As part of the pre-launch prep, a few hours ago the Ubisoft Blog revealed the minimum and recommended PC specs for enjoying The Crew 2. It also revealed some PC exclusive features, detailed video card support, advanced video settings, and a plethora of PC control options that will be available. The basic minimum and recommended PC specs are outlined below in the graphic. However, there is a recommended configuration in-between those shown above in the blog post. If you PC system lies somewhere between the setups outlined, perhaps the 1080p "recommended configuration – 30 fps" will suit you. In brief, this in-between setting requires an Intel Core i5-3470 or AMD FX 6350 CPU, plus an Nvidia GeForce GTX 760 or AMD R9 270X GPU. Advanced video settings look interesting. Ubisoft's upcoming racing sequel has a wide variety of settings, as there are many PC configurations around - though it can auto-detect many common setups. Screens such as 21:9 ratio models are supported, window modes are available, 3-monitor FOV is configurable, you can limit FPS up to 60FPS, and V-Sync can be toggled. Elsewhere you can adjust graphic effect details such as shadows, textures, lighting, blur, anti-aliasing, and various game environment qualities. PC users can play with their trusty mouse and keyboard or one of many controllers from Microsoft, the PS4 controller, the Steam controller and a wide range of steering wheel hardware from the likes of Thrustmaster, Logitech and others. You can even 'borrow' Xbox One and PS4 wheels. 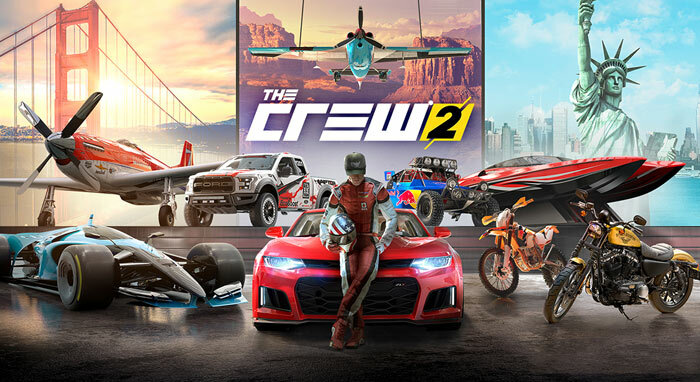 If you are interested in The Crew 2, perhaps you play(ed) the original, then you can head on over to www.thecrewgame.com/beta to sign up for a chance to play the upcoming Closed Beta, set to start on 31st May. The game proper launches on 29th June on PC, PS4 and Xbox One.